Happy New Year! As a new year begins and small businesses starts a fresh year online, you may be asking yourself what you can do better from previous years to increase sales to your online business. Unfortunately many businesses close shop, cut their losses or look for other opportunities online due to lack of sales and site visitors. Competition online within niches is extremely hard for small businesses. Customers are searching Google for reviews, scanning product codes for the best prices and asking friends for recommendations using social media. Often starting a New Year will bring questions that need answering. Can I compete in this market? Am I wasting my time online? How can I do things differently to gain market share? As we start operating in 2015, dedicated business owners and entrepreneurs will have a 2015 business plan for their website. It could be a one page hand written text or a detailed document that lists actions to be taken in 2015. For example business goals and objectives, advertising spend or most importantly how to tackle online competition. Without this basic planning, you might as well throw your money out the drain or give it to your competition. 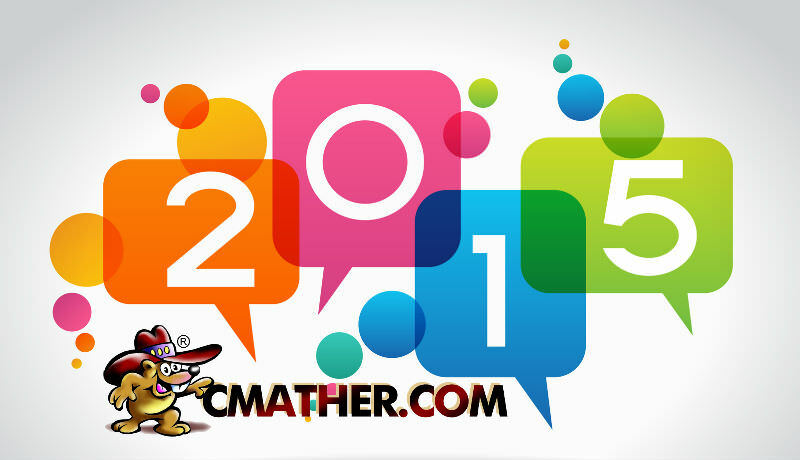 Did you know: Last few months of 2014 at CMather Web Development we didn’t create many new websites? In fact new website design stats were down from previous years. What did increase was business owners redesigning and creating content for their customers that targeted and created a partnership between them. Business Owners are now starting to realise that owning a website is not a one time job; you need to continually develop, strategize and update the site with new information. If you don’t keep with the times your customers will go elsewhere. For CMather, this is our 15th consecutive year online and every year we revisit our business plan, add new services and talk with our customers to develop products that are useful. We don’t hesitate in cutting services, updating prices to match competitors or even offer out of the box ideas to attract new customers. This is what all online businesses need to do in 2015 to keep operating and competing with thousands of other websites. Create a business plan. What do you want to do in 2015? How are you going to attract customers? Set realistic goals for 2015 including Sales, Visitors, and New Likes on Facebook. Learn to use analytics for planning and decision making. Update your content and scripts; refresh your images so your business stands out from the crowd. Don’t be a boring website that customers skip over. Get your site mobile ready. If using WordPress or Joomla, pick a new theme that is mobile ready. Learn how to make your site load faster. Everyone hates a slow loading site! Run some competitions; give away some free products or samples. Offer discounts and coupons to your loyal customers. Give and expect nothing in return. Get Social: Learn more about Facebook, Twitter, Instagram and Pinterest. Respond to your customers online. Show customers you listen to their needs and take action immediately. Check on your domain name and web hosting renewals. Make sure all contact information and details are correct for 2015. Without this there is no website or business. Speak to your web developer on new technology available that will make your life online easier. Speak to them about support tickets, social media scheduling and content management systems. Don’t be afraid of automation. Create a budget for online advertising campaigns. How much are you willing to spend per month to gain new referrals/leads or customers? Did you know: For the first time Mobile ecommerce traffic overtook Computer / Desktop traffic. (Dec 2014). Its official, rather than using desktop computers more people today use mobile phones and tablets to purchase online. Is your website mobile ready in 2015? Are you missing out on over 50% of online generated traffic? Everyday ecommerce is changing the world of business and how we think about doing business online. These are just some ideas businesses should be thinking about today, leading into 2015. Without reviewing this basic information you might find yourself struggling in 2015 alongside the other thousands of websites. The only way to stay ahead is to plan for the future. We hope you and your business is successful in 2015. On behalf of everyone at CMather Web Development, we would like to take this opportunity to wish all our customers and partners a prosperous and wonderful New Year. If you require further clarification on the above points, please don’t hesitate to contact the help desk. Our team will be more than happy to help you out with your business planning to ensure a successful year ahead.